The Marvel Cinematic Universe is home to a variety of characters. We have science gurus with enough knowledge in their brains to outsmart artificial intelligence. We have government agents hiding a plethora of intense badassery. We have lawyers and private investigators, soldiers and kings. We have characters with powers and characters without. We have villains and heroes and a lot of weird species floating around the galaxy. And there are some characters who are so precious, we just want to wrap them up and take them home with us. We want to make sure they're safe, even though we know (because this is Marvel after all) they will most certainly not be safe. There characters, of course, are the cinnamon rolls. 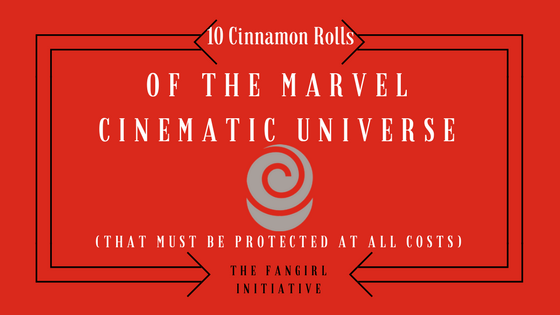 Here are ten cinnamon rolls from the MCU that are too precious for the world (or galaxy). Leo Fitz has been through a lot in his life. He was verbally abused by his father growing up and was almost killed by a close friend, which resulted in cerebral hypoxia. And that's just the beginning. It's come to the point that everybody watching Agents of S.H.I.E.L.D. worries whether he'll be okay by the end of the season. In addition, Fitz is socially awkward and he believes the best in people. But... he's brilliant. Genius-level brilliant. His genius and hope in others make him so precious. You want him to save the day, maybe even get the girl, and basically just be happy. Can he just be happy? If you watched Captain America: The Winter Soldier and didn't love Sam Wilson, there's probably something wrong with you. I kid, but still. Sam Wilson is fantastic. He's loyal to Steve after only knowing him for a short time, and he spends his time helping veterans with PTSD. He's a hard worker and willing to lend a hand, and I don't know what Steve would do without him at times. His fight with Ant-Man is hilarious, and the entire scene just proves how precious Sam truly is. He may have his serious moments, especially in the midst of fighting or when he's talking about serving in the military, but he's light-hearted and has a blast saving the world. He's too precious for the MCU, but I'm glad he's here. Sometimes Peter Quill just wants to kick back and listen to his mixtape, which is okay. He's had a rough life, from not knowing his father (and then learning his father is really a big a-hole) to losing his mother to being kidnapped by Ravagers to becoming an outlaw. He may be part celestial, but deep down, Peter is just a regular guy who happened to help save the galaxy (mostly by accident). I mean, who else tries to defeat a supervillain with a dance-off? For the most part, he can handle himself, but sometimes, I still want to wrap him in a hug and tell him everything is going to be okay. Of course, Groot is one of the most precious characters in the MCU, whether he's several feet tall or several inches tall. His single sentence language is endearing, especially when he modifies it to say, "We are Groot." And as Baby Groot, he's adorable, especially when he's angry. I don't think there's anything about Groot that isn't precious, even if he's attacking people; he's smiling the whole time. And the thing with the glowing light orbs? Too good for the galaxy. There aren't many people like Edwin Jarvis. As butler to Howard Stark, he has his fair share of misadventures, and the number only increases as he aids Peggy Carter in saving the day. Whether he's shooting a gun, doing the laundry, or driving the getaway car, Jarvis is impeccable in all he does, and he has the perfect dry British wit to match. I want to keep Edwin Jarvis protected because the world is a better place with him in it. The best kind of cinnamon rolls are the ones that look like cinnamon rolls but also can beat you to a pulp. This is Matt Murdock, through and through. When he's not brooding over a complicated court case or running around Hell's Kitchen in a mask, Matt Murdock can and will smile, laugh, and make jokes. It's rare to see him in this form, and he only shows this side to the closest of friends, like another cinnamon roll Foggy Nelson, but he does show it. And because Matt Murdock either has a death wish or a serious problem where he believes he is the only one capable of bringing justice to Hell's Kitchen, he really needs to be protected at all costs. Poor baby. One of the best parts of Ant-Man (other than... well, all of it) was the inclusion of Scott Lang's daughter, Cassie. This little girl is amazing. Not only does she love an ugly rabbit doll because it's ugly, she keeps an giant ant as a pet and feeds it food under the table. But this is just the beginning. Cassie is precious because of how her father desperately wants to provide a good life for her. Scott changes his whole life around, becoming Ant-Man in the process, in order to protect his daughter. And Cassie is wonderfully loyal to him. I hope in future movies they expand her character, so she can become Stature, a superhero with abilities similar to Ant-Man. One of the newer additions to the MCU, Danny Rand is all sorts of precious. Everything he does is to help others, even if it jeopardizes Rand Enterprises or his own life. He wants to do the right thing, keeping the Hand away from K'un-Lun and New York City. He plays by his own rules, walks to his own beat, and makes his own decisions. While this develops a lot of enemies and opposition, he pushes through to search for the truth in every action. Danny Rand is adorable, and I worry about him frequently. Until Guardians of the Galaxy Vol. 2, I didn't truly relate to a character from the MCU. Sure, there were many I felt kinship with, but then I met Mantis. Mantis can be perceived as naïve and a little odd. She's socially awkward and feels a lot as an empath. But all of this gives her a different perspective and personality than the rest of the Guardians gang. She's loyal to others and she tries to do the right thing, even if she's not perfect at it. She's so adorable, and I'm glad she's been introduced to the MCU. The universe needed someone like her. Of course, this list would be incomplete without the Friendly Neighborhood Spider-Man. Even his nickname gives off the "too precious for the world" vibe, and that's exactly what Peter Parker is. After watching Spider-Man: Homecoming, I fell in love with Peter Parker for the first time because he is just a kid. He's a teenager trying to save the world, trying to prove he can save the world. And he doesn't give up, even when the Vulture has him pinned down, even when he could walk away and wipe his hands of the situation. He doesn't sit back, he doesn't give in. And his whole attitude is adorable. He's a geek and a loser and maybe too smart for his own good, but he also tries to do the right thing for Aunt May and for his friends. Peter Parker is too good for the world. What other characters from the MCU should be protected at all costs?